If twenty-eight-year-old Monique Morrison had only one wish, it would be to fall in love with a man sent from God; a man who will cherish her forever. But Monique makes a huge mistake when she chooses to help herself. Going against her Christian values, she decides to play house and move in with her musician boyfriend, Boris Cortland. Boris is in no hurry to get to the altar now that Monique has already signed on to play the role of a wife. Though she’s in church Sunday after Sunday, praying for God to touch Boris’ heart and turn him from his wicked ways, it seems Monique’s pleas are going unanswered. Suffering from neglect, rejection, and plenty of verbal abuse, Monique has all but given up on her dream of a relationship that represents unconditional love; that is, until Adonis Cortland moves in and does for Monique all of the things that Boris won’t do. Could Boris’ own cousin be the man Monique had been seeking? 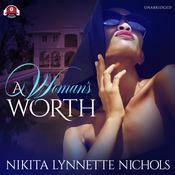 Nikita Lynnette Nichols is an award-winning author and screenwriter from Chicago. In 2007, Miss Nichols signed a two-book deal with Urban Books. Her debut novel entitled A Man’s Worth released in September of 2008.